DAVIS, Jefferson, (son-in-law of President Zachary Taylor), a Representative and a Senator from Mississippi; born in what is now Fairview, Todd County, Ky., June 3, 1808; moved with his parents to a plantation near Woodville, Wilkinson County, Miss. ; attended the country schools, St. Thomas College, Washington County, Ky., Jefferson College, Adams County, Miss., Wilkinson County Academy, and Transylvania University, Lexington, Ky.; graduated from the United States Military Academy, West Point, N.Y., in 1828; served in the Black Hawk War in 1832; promoted to the rank of first lieutenant in the First Dragoons in 1833, and served until 1835, when he resigned; moved to his plantation, Brierfield, in Warren County, Miss., and engaged in cotton planting; elected as a Democrat to the Twenty-ninth Congress and served from March 4, 1845, until October 28, 1846, when he resigned to command the First Regiment of Mississippi Riflemen in the war with Mexico; appointed to the United States Senate to fill the vacancy caused by the death of Jesse Speight; subsequently elected and served from August 10, 1847, until September 23, 1851, when he resigned; chairman, Committee on Military Affairs (Thirtieth through Thirty-second Congresses); unsuccessful candidate for Governor in 1851; appointed Secretary of War by President Franklin Pierce 1853-1857; again elected as a Democrat to the United States Senate and served from March 4, 1857, until January 21, 1861, when he withdrew; seat declared vacant by Senate resolution on March 4, 1861; chairman, Committee on Military Affairs and the Militia (Thirty-fifth and Thirty-sixth Congresses); commissioned major general of the State militia in January 1861; chosen President of the Confederacy by the Provisional Congress and inaugurated in Montgomery, Ala., February 18, 1861; elected President of the Confederacy for a term of six years and inaugurated in Richmond, Va., February 22, 1862; captured by Union troops in Irwinsville, Ga., May 10, 1865; imprisoned in Fortress Monroe, indicted for treason, and was paroled in the custody of the court in 1867; returned to Mississippi and spent the remaining years of his life writing; died in New Orleans, La., on December 6, 1889; lay in state in City Hall of New Orleans, December 8-11, followed by interment in Metairie Cemetery, New Orleans, La. ; reinterment on May 31, 1893, in Hollywood Cemetery, Richmond, Va.; the legal disabilities placed upon him were removed, and he was posthumously restored to the full rights of citizenship, effective December 25, 1868, pursuant to a Joint Resolution of Congress (Public Law 95-466), approved October 17, 1978. American National Biography; Dictionary of American Biography; The Yale Biographical Dictionary of American Law; Davis, Jefferson. 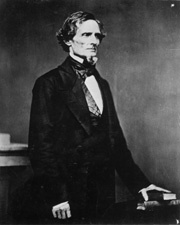 The Papers of Jefferson Davis. Edited by Haskell Monroe, James McIntosh, Lynda Lasswell Crist, and Mary Seaton Dix. 10 vols. to date. Baton Rouge: Louisiana State University Press, 1971-; Cooper, William J., Jr. Jefferson Davis, American. New York: Knopf, 2000.